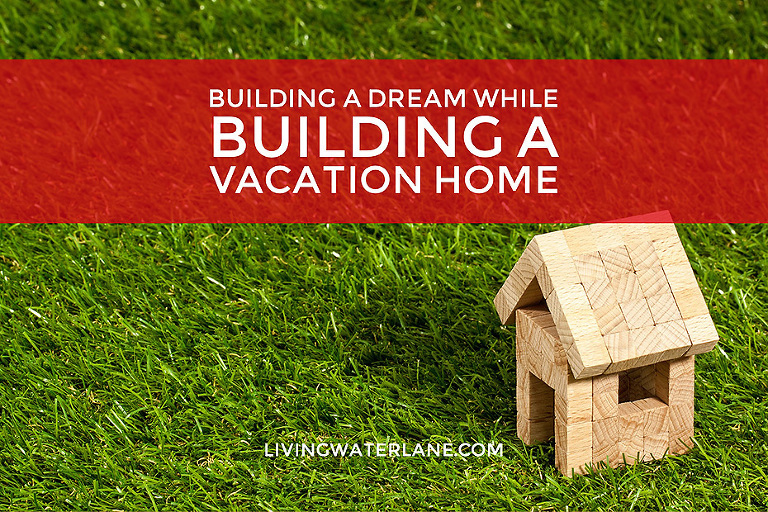 Last year, when we decided to begin in the Vacation Rental Business, we allowed ourselves to dream a dream. One that Mike and I have talked about numerous times through the years that we have been married. Our dream involved creating a place that would bring people together to hold retreats, host events, and lead conferences. We knew that we had a special place here and wanted to find ways to diversify our offerings and ultimately our income stream. We heard about a program that is being offered through our local high school. It is truly a remarkable program that is teaching students to frame and dry in a house all within one semester. Having known the teacher for years through my past in banking and his work as a contractor, I knew that he would be an excellent choice for our homes and that this project would be a great support to our school system and its students. So, we wrote a check and prepaid for our second rental home. 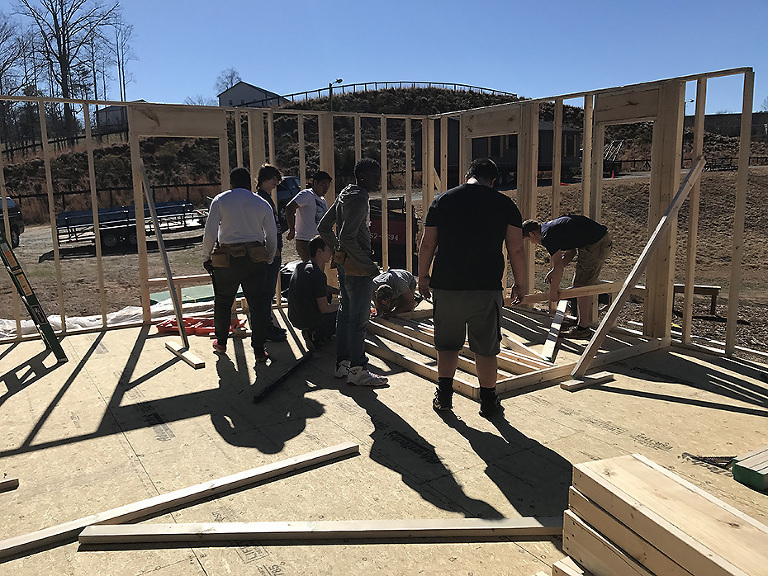 The way the program works, the teacher calculates approximate costs of the materials of the house and then adds 10% that will go back into the program to buy tools and equipment for the students and we get a house that is framed with windows, doors, roofing shingles and hardi-siding installed and painted. For our home, this total came to $16,200 for a 960 sq. ft. home. 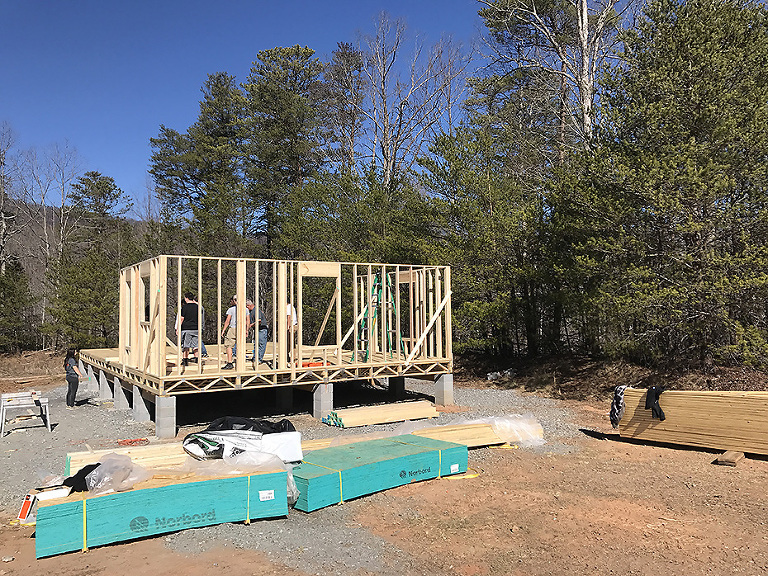 Know that we were avoiding the costs of a contractor, carpenter, roofer, painter, etc made it very clear to us that we needed to jump on this project! 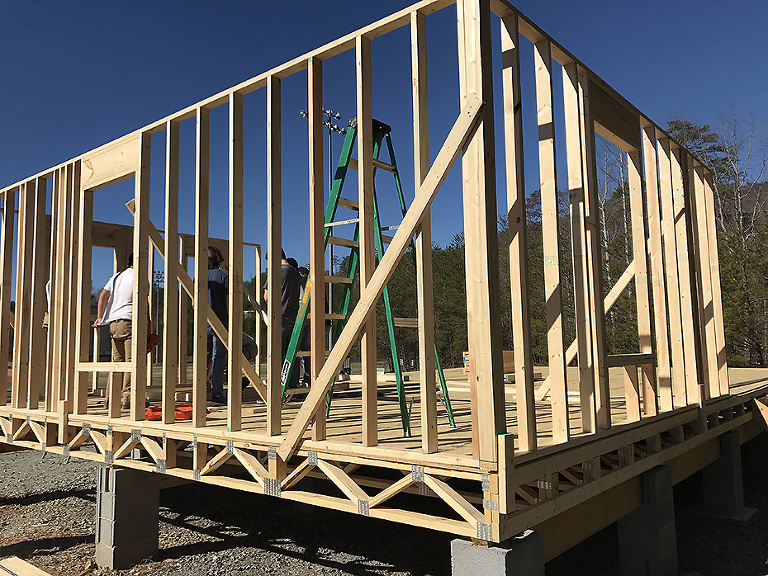 We feel the labor savings are approximately $15,000+ on this first house! We are so thankful for Lowe’s cooperation with the program and offering to lock in prices for the first 4 houses! In just two weeks (fingers and toes crossed) we will move our house to our property to begin the process of making it all prettied up for our guests. The moving expense is eating into our savings a bit, but again, we feel like we are coming out way ahead in the long run. So…without further ado…would you like to take a look at all the work that these amazing students have done this semester??? Here are a few pics of the first stages where the floor system is complete and the walls are going up. I was shocked that they had so much complete in the first week! Walls are up and the house is wrapped!! These kids have the prettiest place around to work! Roof Trusses are what make a shell look like a home! So exciting to see this house take shape and to walk through and think about each room now in real life! The HardiePanel Siding is gorgeous…and the shingles make me happy to see! All of our houses will have a farmhouse feel. We figured since we are a farm, that we would not jump on the cabin bandwagon, but would do something different that would set our Retreats apart. Hello Beautiful White Walls and Windows!!!! Oh my goodness! I love this so much! The black trim and windows just really are the icing on the cake! Finally, here are a couple pictures of the inside…not too many because, one, its hard to tell what is what, but also, because I want to share all about this process as we go!! Isn’t this exciting!!! I can not wait to share all that is happening here through the Summer as we finish up grading for the houses and begin to bring in Subs to finish this beauty up!! Stay tuned!! !